I used to be a morning person. Rise early to undergo a complex series of morning routines (lemon water, oil pulling, yoga, smoothie, blog reading) before most people even got out of bed. By lunch I had usually already completed the most pressing tasks of the day, and could spend the afternoon as I pleased. Today? Not so much. When the alarm goes off at 7.30-8, I’m so tired. That 10 minute meditation that I each night promise myself I will do in the morning feels like an immense obstacle. The only reason I actually do it (most days, not all days) is because it means I get to stay in bed for another 10 minutes. And possibly fall asleep just a little bit again (oops). During this tired phase (cause I know it’s just a phase), breakfast preparations are key. I’m one of those people who can’t get started with my workday too late or I’ll constantly feel like I’m behind, desperately trying to catch up. So since I sleep later than usual, I need my morning routines to be fast. Chia pudding has been my go-to during the entire spring, but honestly I’m a teeny bit sick of it. My body is craving a bigger variety in grains and seeds. I also wanna be able to boost my breakfast with superfoods like bee pollen, cacao nibs and matcha, since I apparently seem to need those extra nutrients right now. And smoothies are out of the question. When I’m this tired in the morning, I just can’t be bothered with chopping up all those fruit and veggies and then having to clean the blender afterwards. Solution? Bircher Muesli! Or whatever you wanna call this soaked cereal/porridge kinda bowl. You mix a bunch of grains/seeds/ nuts/dried fruit in a bowl with plant milk and spices, and let it sit in the fridge overnight. In the morning the soaked muesli is ready to enjoy straight away! Bircher Muesli is really no rocket science. You can add virtually whatever grains, seeds, nuts and dried fruits you happen to have at home. My recent pantry favorite is yellow raisins, so I threw in some of those to the mix, along with oats, pumpkin seeds, coconut, vanilla, cardamom, maple syrup and almond milk. And the matcha powder of course. 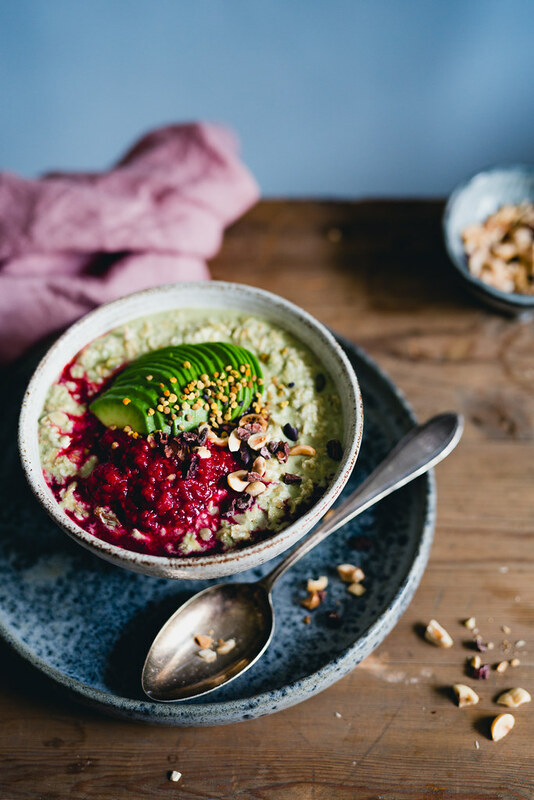 I’ve made different kinds of Bircher Muesli and Overnight Oats since ages ago, but Matcha is a new addition to my pantry (purchased during a weak moment at the health food store 😜). Aside from making some honestly damn glorious matcha lattes in the afternoon to treat the 3 o’clock creativity blues, I’ve experimented with adding Matcha to my breakfast bowls. I find that it pairs especially well with vanilla and cardamom, and even better with a little maple syrup added to the mix! Matcha is mildly stimulating and uplifting, and it’s said to promote mind clarity (which we all probably could need in the morning… Especially if you wanna go easy on the coffee drinking). It gives a slightly grassy, round flavor to the muesli that I personally think is really delicious with the vanilla, cardamom and sweet milk. The flavor is not as overwhelming as in for example a matcha latte, so if you’re new to matcha, this might be just the recipe to try! If I’m gonna be completely honest with you, I haven’t prioritized my health at all in the last couple of months. If you read my previous blog post on spring time anxiety, you know why. It hasn’t been a catastrophe, but since I’m generally a very health-driven, mindful and intuitive person, I definitely could have listened to my body better. But now I finally feel dedicated to making a change! There’s so many exciting things going on in my life right now, and I wanna have the strength, energy and mind-space to enjoy it. I might even attempt to become a morning person again… This morning for example I was forced up inhumanely early to receive a little dog person delivered to me by bike in a small Kånken backpack <3 (belonging to my brother). And we’ve been up working hard/seeking adventure ever since! When I write this it’s closing in on 3 o’clock and hence time for that matcha latte… Perhaps I just need to get used to the idea of rising early again, and not let it stress me out in the evening for fear of not getting enough sleep. Tell me about your week! What have you been up to? What’s going on in your mind? 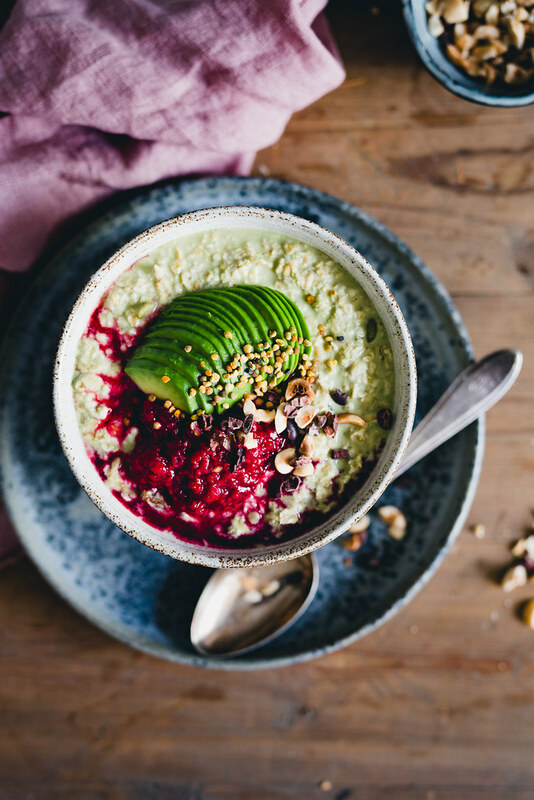 The night before, mix all ingredients except raspberries and avocado in a jar or large bowl. Add maple syrup if you like a little extra sweetener (depends on if your milk is sweetened or not). Let it sit in the fridge overnight. In the morning, thaw raspberries either on the stove or in the microwave until warm and melted. 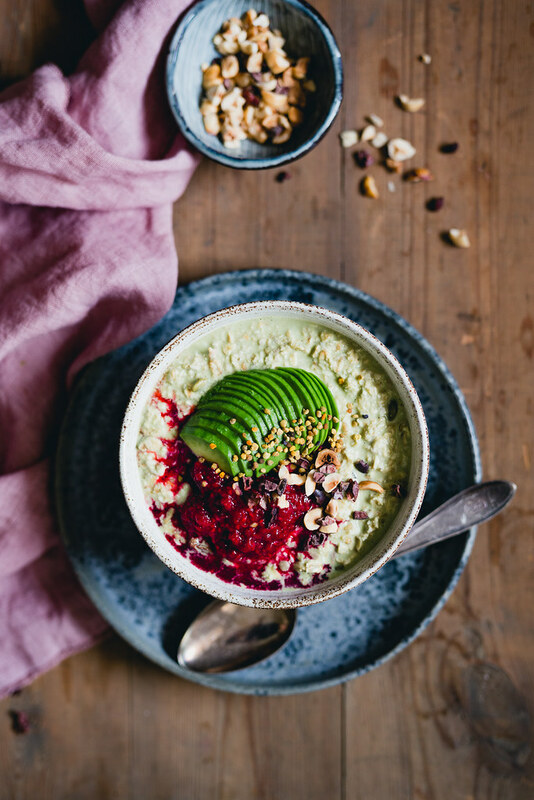 Divide the matcha bircher muesli between two bowls, top with raspberry mash, avocado and toppings of choice. Enjoy! Ps. Remember to hit the heart button if you like this post, so I know what you wanna see more of! All photographs, recipes and content are Cashew Kitchen originals, unless otherwise indicated. Feel free to go wild on pinning, but remember all content is copyright protected. Always link back here and credit Cashew Kitchen when sharing. Thanks! Åh vad fint att du kan göra en sak som gör morgonen lättare när det är så här. Det räcker ju att börja någonstans, när en ska försöka vända en negativ trend. Jag tror på dig! Jag är så tacksam att jag kan haka på min inneboendes rutiner lite samtidigt som jag nu äntligen börjar hitta balansen mellan att följa dem och mina egna. Just idag är jag väldigt trött av värmen och en känslomässig berg-och-dalbana det senaste dygnet. Allt från stulen cykel till ett värdefullt mail. Kram på dig!